The 'Toolsy' Outfield Four - Who Rebounds? Just a year ago, one of the perceived strengths in a thin White Sox farm system was talent depth in the outfield. That crowd was led by four raw, ‘toolsy’ athletes: Courtney Hawkins, Trayce Thompson, Jared Mitchell and Keenyn Walker. All four have some combination of plus tools, from power, speed, glove and arm strength. All four also share one bugaboo – major questions about their ability to put bat to ball consistently. And now they all have a disappointing 2013 season in common, causing their prospect stocks to drop significantly. Given the talents involved, the ceilings on these players are still quite high, and none should be written off yet. But which of them have a shot at approaching their projected ceilings? Which ones have a likely floor that justifies a major league roster spot? What went wrong for each of them in 2013? And what are the key indicators for each that would predicate their success? Let’s start with the differences between Hawkins and the rest of this group. Courtney was the 13th overall pick in the 2012 draft; this means he’s got a slightly higher draft pedigree than the others, but also that he’s had only 1.5 seasons in the minors. In terms of his tool set, Hawkins has plus raw power, a plus arm, above average athleticism, competent glove and good speed. When drafted he was compared to Matt Kemp by MLB Network, which gives you some idea of his ceiling. If all goes to plan, he could be an above average defensive corner outfielder who hits for significant power from the middle of the order and steals some bases to boot. His draft year results seemed to indicate those lofty projections were justified, as he compiled a .284/.324/.480 line across three levels (Rk, A, A+) at age 18, and found himself on top 100 MLB prospect lists. But an aggressive assignment to Advanced A Winston-Salem in 2013 was too much for the 19 year old, and to say he struggled would be an understatement. Hawkins posted a .178/.249/.384 line and struck out an alarming 37.6% of the time (was 22.5% in 2012). Breaking down his season further, in his first month, he had struck out in an improbable half of his plate appearances. If you want to see some reasons why, read our article from April deconstructing his mechanics. After an injury kept him out for a few weeks, he started making changes and the whiff rate decreased as a result, but the power also vanished. By August, Courtney seemed to have lost a bit of his swagger, and recent statements from Buddy Bell seem to say that was part of the plan. Another factor worth pointing out, Hawkins had the lowest BABIP (.236) among all 2013 T100 prospects in the minors. Considering he hit for significant power and still makes loud contact when he squares it up, there is a strong chance Hawkins encountered some bad luck that isn’t likely to recur. Hawkins is already a decent and developing defensive outfielder with a strong arm, and his current power is significant (19 HR last year despite hitting .178 and missing some time). His major league floor may be Joe Borchard or perhaps not even that. One of the two big keys for him is pitch recognition and the contact rate that flows from that. He can hit breaking balls hard and does, when he guesses right – but without guessing, he needs to see and adapt to pitches, which was difficult with all that mechanical noise from earlier in the season. The other key is, now that they’ve moved him up in the box and reduced some load noise, can he get comfortable in a new platform and still make use of that power. That’s a lot for a 20 year old to deal with, so patience is required here, and he isn’t likely to suddenly spring back to a big season in 2014. He’s got time and will need it. But with his youth and tools, his chances of reaching a point close to his ceiling are still pretty good, given the right guidance. It just won’t likely be this year. Unlike Hawkins, Thompson has had 5 seasons in pro ball and was a 2nd round pick. Trayce is a tool shed – plus arm, plus glove, plus power potential, above average speed and athleticism. While he doesn’t possess as much raw power, defensively he’s already past Hawkins’ likely ceiling and has better speed. Despite being a lower round pick than any of the four outfielders discussed here, his ceiling is only surpassed by Hawkins’. Thompson’s results have been mixed over the years, and he has shown flashes of putting it together at the plate from time to time. He had a pretty good 2012, putting up a .253/.328/.482 line with 21 SB mostly at A+ with brief stops at AA and AAA, while striking out 28.2% of the time. But just as it appeared he was putting it together, his 2013 at Birmingham brought him back down to earth (.229/.321/.383). His 23.6% K/PA was actually a marked improvement, as was the .102 Iso OBP, but the hits and power (15 HR in 2013 vs 22 in 2012) disappeared. Thompson’s .279 BABIP (vs .329 in 2012) would seem to indicate some limited bad luck, but the accompanied drop in Iso SLG (.154 in 2013 vs .229 in 2012) hints that he probably wasn’t making as much hard contact. It seems likely that the increased walks and decreased strikeouts were part of an intended effort, at the sacrifice of power. In this sense there is a similar theme with Hawkins, though not as extreme. He also hit dramatically better at home (.277/.366/.466) than on the road (.182/.277/.302), which is far more difference than any park factor should dictate. The floor is already close to a major league 4th OF – plus defense at all slots, dangerous speed, some pop and some walks. But in order to be a starter and reach his very enticing potential, he needs to take the apparent lessons in bat control, and add his natural power back into it. That balance between hard contact and plate discipline is the key to this athlete’s future success. Given his floor and tools, and indications of the right adjustments underway, he’s likely going to be a major leaguer and still has a shot at being more than just a bench guy. At the time he was drafted, Mitchell’s athleticism was at a level above any of this foursome. He had legitimately elite speed, which may or may not have fully come back after rehabbing from his 2010 leg injury that caused him to miss the entire season. His glove and speed make him a strong defender across the outfield, he draws a ton of walks, and shows flashes of power. Jared was very raw when drafted, and his overall offensive results since the injury just haven’t lived up to expectations. This former football player’s 2012 season in AA looked OK on the surface (.808 OPS), but there were red flags too (.240 AVG, 30.9% K/PA). He was promoted to AAA anyway and struggled in 141 PA (.231/.329/.364, 37.6% K/PA). In 2013, after a disastrous start at AAA (.132/.277/.170 in 14 games), he finished the season back in Birmingham and didn’t look much better (.174/.297/.275, 33.0% K/PA). In a move that was puzzling at the time, he went back for a 2nd AFL stint, and surprised with .304/.425/.580 line including 5 HR and a K rate around “only” 20% in 20 games. One of the concerns with Mitchell is that he just doesn’t take the bat off his shoulder enough, as evidenced by big Iso OBP numbers and lots of backwards K’s. BABIP (.260 in 2013) and an unspectacular Iso SLG (.090) seem to show he just isn’t putting much power on the ball, especially since his speed should add to his infield hits and non-HR XBH’s. Not entirely dissimilar to Hawkins and Thompson, Mitchell needs to find the balance between plate discipline and effective bat speed, though in his case he is perhaps a little too tentative. Mitchell’s floor is not yet a major leaguer, despite the AFL success and protestations from Buddy Bell. Given his above average or better defense, still-significant speed and ability to draw walks, if he can hit just a little and put some juice on the ball, he could be a prototypical leadoff hitter and starting outfielder in the majors. But the chances of that, going into his age 25 season with 2 years of deteriorating results at AA and above under his belt, seem slim at this point. Walker has the best natural and effective speed of this foursome (recorded a 6.68 60-yard dash time), and like the others he was drafted as a raw hitter in need of development. But unlike the rest of the crowd, Walker has fairly minimal power potential and will need to rely on high OBP and AVG combined with his speed to be a valuable lineup contributor. His glove and routes in the outfield were unrefined coming in, but multiple scouting reports indicate he’s made significant strides as a defender and he does have enough arm to play across all three slots. Like Mitchell, Walker has had to contend with injuries, and that may have had an effect on his results. In his first full pro season in 2012, he opened with Class A Kannapolis and did what he was supposed to – get on base and steal bases (.282/.395/.387, 39 SB). 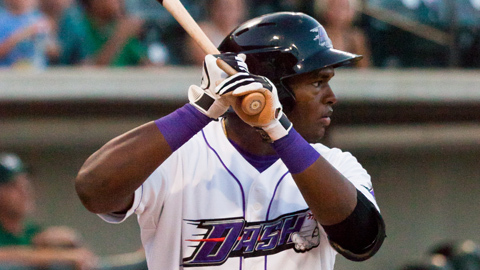 On promotion to Winston-Salem though, his numbers dropped off (.238/.345/.364, 17 SB), likely in part due to separate knee (June) and shoulder (July) injuries that resulted in his having surgery on both in September of that year. His K/PA rate was high throughout the season though, hovering around 30% in each stint. 2013 saw him in AA where he may have been over his head, and he posted a .201/.319/.277 line, stole 38 bases but was caught 15 times, and struck out in 27.8% of his plate appearances. One consistent positive is the walk rates, and he’s been above .100 Iso OBP each of the past two seasons even as he struggled with the bat. Walker has indicated he may not have been fully recovered when he began the season. Given his recovery from those injuries and a developmentally aggressive assignment to Birmingham in 2013, he may have the best case of the bunch for a strong rebound in 2014. Walker will be 23 but effectively more raw than that, and have the chance to repeat AA at full health. The problem is, given the lack of power, he’s got significantly less room for error than the others. Keenyn will need to find that high OBP again, put bat to ball more regularly, and continue to improve defensively to be successful. Like Mitchell and Hawkins, Walker’s floor is below major league level at this point. But his ceiling is a high OBP, base-stealing leadoff hitter who can use his speed and improved glove work to handle the corners well and perhaps man center field. Like Hawkins, his development story still has a ways to go. He’ll need another year or two before he’s in any firm plans in Chicago, but at this point he’s still got a shot if he can reach first base at a high rate. Looking at the whole group, Walker would seem to have the best chance at an immediate rebound in 2014, with Mitchell next most likely. Ceiling-wise, Hawkins still sits atop the list, though Thompson is close. Floor is the closest contest, but Thompson stands a bit higher than the others. In terms of chances of reaching a point at least somewhat close to their respective ceilings, it has to be Hawkins, with Walker next most likely. With four such talented athletes, the good news for Sox fans is, there is a very good chance at least one or two of them will have an improved 2014. Even with disappointing 2013 seasons for all of them, it is still likely someone (or some two) will become productive major leaguers in the future. If you want to see video, we have some for all four players (and about 40 others) on our YouTube channel, so check that out too. Really good article. I'm thrilled with the number of posts Future Sox has been cranking out lately. Gonna be a good year. Nobody talks about Chris Curley. How come? I know he's a little older but he has only had 4 seasons of professional ball. Chris Curley is going into his age 26 season having never played above A+. He had a good season at W-S this past year, and I was impressed with him professionally when I interviewed him in August. But he's blocked by a number of infield prospects in an improved system. To see the majors, a lot of things would need to go just right, and it isn't likely to happen. Nothing is impossible though. I am disappointed that the Sox let go of Jake Elmore. I think they want Leury Garcia to be a utility player but I think he needs at least a few months in AAA. Elmore was a perfect stopgap. It is not difficult to give Garcia, Simien and Sanchez at bats between 2nd, short, 3rd and DH. Why is Dan Black never considered in any prospect list? Also, could you give us information on how to submit fan posts? I could try to write some stuff to at least get people thinking White Sox and not go more than a week without a post. I really like this site and would like to contribute to make it more popular. Elmore didn't really have a place on the team, with the infield crowd already there (Keppinger et al), and Garcia in the wings. Dan Black was in our Next Wave article about guys to watch outside the T25, but you won't see his name on any top prospect lists. There are scenarios in which he could end up in Chicago, but they are touch pairings. For example, when Dunn (during season or at end) and Konerko are gone, if Viciedo doesn't put it together, AND if Dan has a big year in AAA, AND if Wilkins doesn't perform, then Black could find himself in the mix. We've never done fan posts before. We've had a couple player-written pieces, but never ones from readers. We'll have to discuss that internally. Thanks for the offer!